Since 2009, Price, an orthopedic surgeon, has been a member of the American Association of Physicians and Surgeons (AAPS), a group whose members sign a “declaration of independence” renouncing payments from third-party payers, whether government or private insurers. Their journal has published articles opposing taxes on cigarettes, linking abortion and breast cancer, doubting whether HIV causes AIDS, and opposing mandatory vaccinations. They oppose regulating medical practice even as far as hospital peer reviews, and are fiercely for free-market medicine. The secretary of health and human services oversees the Center for Medicare and Medicaid Services and the implementation of the Affordable Care Act. When privatizing Medicare, turning Medicaid into block grants to the states, and cutting these programs’ funding is on the table, Price’s belief in “free-market medicine” becomes frighteningly relevant. He will also oversee the Institutes for Health, the National Institutes for Mental Health, the Food and Drug Administration — giving him vast influence on medical research, the approval process for medications, and public health. While I don’t know Price’s opinions on the subjects covered in the AAPS journal, I find his continuing membership in the organization troublesome. He supports Speaker Paul Ryan’s plans to privatize Medicare, which could come to the floor early this year. 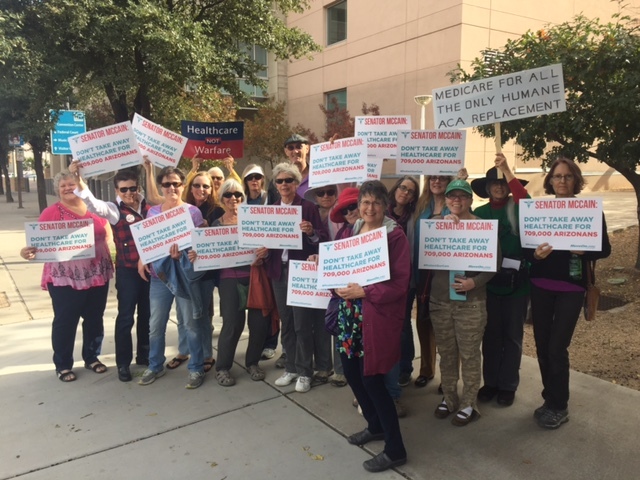 Such changes would not affect current Medicare recipients, but Price would put more of the cost of medical care on seniors and the disabled who receive Medicare: As the law stands, providers must accept the amount that Medicare will reimburse as full payment for the care provided. Price, however, favors allowing providers to bill patients directly for the difference between what Medicare pays and their usual price, a practice called balance billing. A tea party Republican, Price has opposed practically all efforts to support women’s health. He is strongly anti-choice, with a zero percent rating from Planned Parenthood and a 100 percent rating from the Susan B. Anthony List, an anti-abortion group. Price has voted to prohibit Planned Parenthood from receiving funding from Title X and Medicaid. In fact, he famously opined that no woman has ever not had access to birth control because of cost. Since the election, and even more since Price’s appointment, women have rushed to get long-acting contraception such as IUDs, and to hoard emergency contraception in fear of losing this coverage. And the specific preventive care that must be provided without cost to patients is not mandated by the ACA, but regulated separately, so the birth control mandate could be changed by the new administration without any action by Congress. Tom Price poses a grave threat to women’s health in this country. If Price had his way, millions of women could be cut off from Planned Parenthood’s preventive health services like birth control, cancer screenings and STD tests. From his plan to take no-copay birth control away from 55 million women and allow insurance companies to charge women more for the same health coverage, to his opposition to safe and legal abortion, Price could take women back decades. Tom Price has consistently demonstrated that he’s out of touch with women’s lives. Despite the fact that 20.2 million women need publicly funded contraception, he has falsely stated that every single woman in America already has access to affordable birth control. As if all this weren’t enough to raise grave doubts about Price’s appointment, the issue of conflict of interest has come up as well, and Senate Democrats are calling for a thorough ethics investigation before he is confirmed. Price is not one of the wealthiest members of Congress, let alone of Trump’s cabinet, but among his investments is approximately $300,000 in health-related businesses, including pharmaceutical companies, medical-device manufacturers, and health insurance providers, and he held these while working on legislation that could have an impact on these holdings. And health-related companies are among his largest contributors. As HHS secretary, Price would set regulatory policies on these businesses, and negotiate Medicare and Medicaid rates for these services and products. Price begins with an anti-regulation perspective. How would his relationships with these businesses impact his decisions? When I began researching this article, I knew Price was anti-choice and committed to repealing the ACA. The more I learned, the more alarmed I became. It’s hard to rate the outrageousness of Trump’s cabinet picks, and, being a doctor, Price is perhaps better qualified for his appointment than many, but he is certainly among those who could do the most harm to the greatest number of Americans. Take me, for example. I have had two organs removed due to cancer, and have also had a few skin cancers removed. I am medicated for hypertension, low thyroid, and depression, and require close monitoring for several chronic conditions. With Medicare and QMBY (the Medicaid-funded subsidy for low-income Medicare recipients), I only have a low copay for medications that comes out of my pocket — QMBY covers my Medicare premiums and the 20 percent of all costs not covered by Medicare. Sending people like me into an unregulated private insurance market with a subsidy of perhaps $8,000 a year would leave us with only high-deductible, high-copay insurance available, and I certainly would not be able to afford it. As for QMBY, it’s a Medicaid program. If Medicaid were turned into block grants, it would likely be dropped by many states. I doubt I would be able to pay premiums, let alone deductibles and copays, for the medical care I need. Am I an extreme case? I don’t think so, especially with an aging population. Medicare was necessary because seniors were eating cat food to pay for their medications, and that was 50 years ago, before costs skyrocketed. And I’m only part of one group that depends on these programs. Other vulnerable populations include children living in or near poverty, pregnant women, the disabled, and children with serious medical problems. We must stay vigilant. Tom Price’s confirmation hearing is scheduled for tomorrow, January 18, before the Health, Education, Labor, and Pensions committee. You can contact the committee chairman, Sen. Lamar Alexander, or ranking Democrat Sen. Patty Murray, by phone to let your views be heard. You can also let Sens. 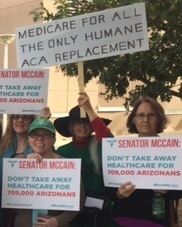 John McCain and Jeff Flake know of your concerns about Price’s confirmation by contacting their offices. This entry was posted in National News and tagged abortion, Affordable Care Act, American Association of Physicians and Surgeons, Betsy DeVos, birth control, birth control mandate, block grant, cancer screenings, Cecile Richards, Center for Medicare and Medicaid Services, contraception, Environmental Protection Agency, Exxon, Food and Drug Administration, Health and Human Services, health insurance, Jeff Sessions, John McCain, Medicaid, Medicare, Obamacare, Paul Ryan, QMBY, Qualified Medicare Beneficiaries, Rex Tillerson, Russia, Scott Pruitt, Title X, Tom Price by Rachel Port. Bookmark the permalink.